Use the information in the tables on this page to make a graph of the United States population from 1800–2040. Graph the United States rate of growth for each decade using your data. Do you get any negative numbers? Can the rate decrease even though population increases? Explain your answer. 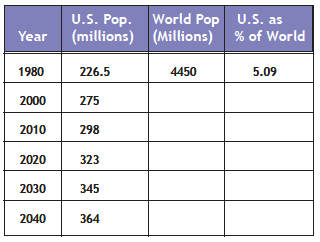 Compare the U.S.to the rest of the world by completing the Table 5B. 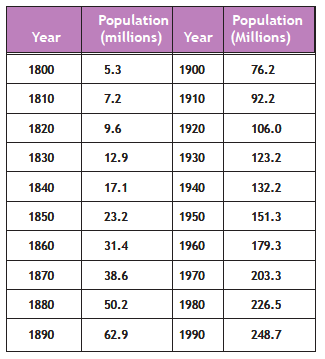 You may use the graph on the next page to estimate values of world population in the future. Note that the graph is of yearly increase, not actual population numbers. << Back to Population Growth Chapter 4 - "The History of Human Population Growth"